The 2382-15 17th Edition course Bristol covers all aspects of the previous 17th Edition course but also includes the new sections specified in Amendment 3. The 17th Edition Bristol course has no practical elements and includes classroom work only. Our Bristol 17th edition course will get you fully qualified to the latest standards of the IET Wiring Regulations, including Amendment 3 (2015). The Bristol 17th edition course is fully accredited by City and Guilds and gives you a recognised qualification (2382-15), allowing you to move on to further qualifications and start a career in the electrical industry. By taking this course, you will gain thorough understanding of the IET Wiring Regulations and how they apply to the daily work of electrical installers and all other professionals involved with electrical work. The course is theory-based, and finished with an open-book exam upon successful completion of the modules. City and Guilds 2382-15 takes into account the latest changes to the Wiring Regs – Amendment 3 – which officially became mandatory in July 2015. For those already with an existing 17th edition qualification, you must take the course again to ensure you remain compliant with the latest changes brought under Amendment 3. The Bristol 17th edition course is ideal for those in both Bristol and the surrounding area, including Keynsham, Weston-super-Mare, Thornbury and Bath. What Are The 17th Edition Regulations? 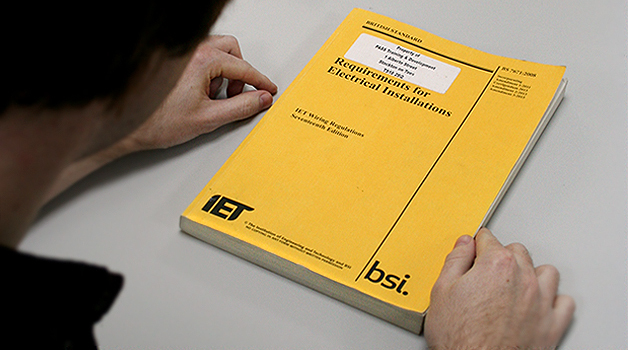 Regularly revised to reflect changes brought about by new innovations and installation techniques, the IET Wiring Regs have become the industry standard for work on electrics in the UK. It is recommended that all people considering taking the Bristol 17th edition course own a copy of the latest edition of the Wiring Regs. You can purchase a copy of the book you will need from this link.